The definition of brand identity (or corporate identity): the collection of designs that represent an organization to customers. What are common pieces in a brand identity? How is brand identity differ from brand image? What makes for an effective brand identity? Brand Identity is what designers contribute to the brand. As long as there have been marketplaces to sell goods, there has been a need differentiate offerings from other sellers. Enterprising craftspeople as far back as 2300 BCE realized that if they marked their products with a consistent symbol, people would recognize them. This is the earliest form of brand identity. Ancient designers created cylinder seals stamp designs into wax or ceramics. Now, it is far easier to mark your products with brand elements using print and digital technology, but the concept is as powerful as ever. Every non-commodity product requires a brand identity. Designers (graphic designers, industrial designers, and UI designers) create the face of a brand. That face should help shape the brand image that a marketer or entrepreneur is trying to project. The design elements that express the brand image is the brand identity. The brand identity is a collection of designs, from the logo to building signage. The elements of any brand identity will vary depending on the needs of each company; a skateboard manufacturer is going to require different designs than an app company. But there are designs every modern company will require. All of these are generally collected in a brand standards guide. We have an article about creating the perfect brand standards guide. Branding vs. Brand Image vs. Brand Identity. I hear people use the terms brand, branding, and brand identity interchangeably. Sometimes, a novice brand marketer will even throw ‘brand image’ in there, in an attempt to look sophisticated. These terms are different. And using the terminology correctly can help quickly get business people, marketers and designers communicate. Brand: The memories and emotional associations in the customers’ minds. Full definition. Branding: All activities (design, promotion, communication) that create the brand. Brand Image: The intended brand as determined by the marketer or entrepreneur. Brand Identity: The designs made with the intent to create the desired brand image. Simply stated, the brand image is the vision of the brand by the marketer / entrepreneur, and the brand identity is the designer’s expression of that. It will become the brand if it works as intended in the minds of customers. Brand equity is part of a company’s value attributable to brand. All of a companies value is determined by how much revenue and profit it can generate in the future. We go into more detail in our definition of brand equity, as well as discuss how Apple’s brand is worth $170 billion. Apple’s brand identity is the most recognizable and meaningful example in the world. 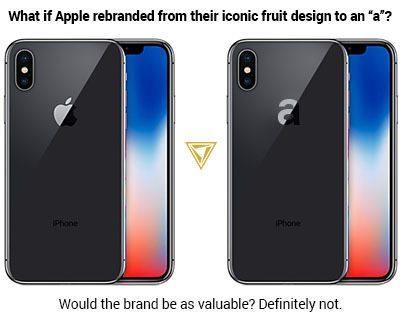 If you put an Apple logo on a product, it is going to sell because of what that logo says to the customer. But what if Apple inexplicably changed their logo to a lowercase “a”? Their brand would be far less effective because the “a” logo would be much less recognizable than the apple logo. The brand equity of Apple would go down by billions of dollars if they changed their brand equity in a big way. So, big changes in brand identity destroy brand equity. Large companies with million or billion dollar brands take this very seriously. But a typical mistake small companies make is changing their brand identity to frequently. This damages a significant asset: the company’s brand. 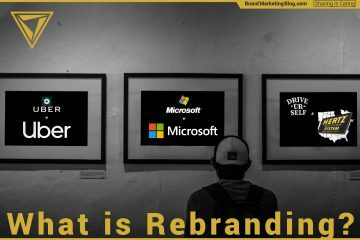 A weak brand identity used consistently is preferable to frequent rebrands, even if they look better. What makes a strong brand identity? Easy: a strong brand identity just looks wicked cool, right? A strong brand identity is an effective brand identity; one that furthers business objectives and projects the brand image the marketer or entrepreneur wants to create for customers. Of note: Examples of strong brand identities on Colin Finkle’s Pinterest. How to build a brand identity. I wish building a brand identity were as easy as reaching out to the applicable designers and letting them whip up some designs. But you will be wasting your time and money without some work before involving designers. You need to define the brand image before a designer has a hope of expressing it for you. 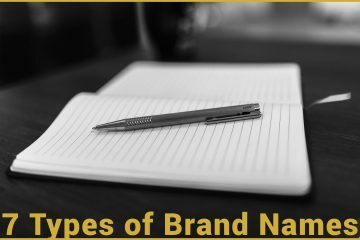 You need to determine what the brand identity needs to communicate, emotions it needs to elicit, and personality traits it could be described as. All of this should be expressed in a design brief which you deliver to the designers working on your brand identity. Maybe you are a product guy and do not know what the brand image should be. That is okay. I would recommend working with a branding firm (like us at BMB) over a designer; branding firms will have the marketing minds to talk through a brand image as well as the designers to execute a brand identity. We have an article on where to look for people to design a logo. Loved the Content.Thank you for Sharing. Glad you appreciate the distinction! Thanks. Brand identity is usually misunderstood. Good luck with your work, Brand Theatre.